The new Shanghai Museum is situated on the People's Square, the political and cultural centre of Shanghai. The square boasts a giant musical fountain and several attractive green recreational areas where locals dance and fly kites. It is surrounded by the City Hall, an underground shopping centre, and the Grand Shanghai Theatre. 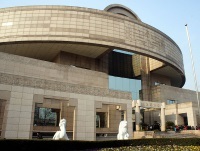 However, the Shanghai Museum, opened in 1996, draws the most interest from tourists. The building is shaped like a giant bronze urn, and the museum contains a collection of about 123,000 cultural artefacts in 21 categories. The permanent galleries of this impressive museum include: Chinese Ancient Bronze, Chinese Ancient Ceramics, Chinese Paintings, Chinese Calligraphy, Chinese Ancient Sculpture, Chinese Ancient Jade, Chinese Coins, Ming and Qing Furniture, Chinese Seals, and Chinese Minority Nationalities' Art. There is a restaurant and an art store within the museum. If visitors do not speak Chinese, they should look out for the museum's advanced audio tour, which is offered in eight languages. As the lines can get rather long, it is worth getting to the museum early. If it is a hot day, visitors should enter via the south entrance rather than the north, as it is possible there to queue undercover.